With the National Leagues paused on Saturday APD Dumfries travelled to Ayr for a regional Murgitroyd Twenty/20 festival. In the first match against Premiership side Greenock events revolved around newly arrived Kiwi professional and Test player Tim McIntosh. Dumfries reached 54 for none after six overs whereas Greenock were subsequently 10 for 1 at the same stage. Beveridge and Breetzke rattled along until Breetzke was bowled for 25 and Beveridge was lbw for 41 with the score on 81 at the half way point. However the remaining overs were less productive and Dumfries ended on 117 for 8. Dumfries bowled tightly at the start of the Greenock innings Maskrey conceding just two runs in three overs. However one over, bowled by a late substitute from Ayr, went for thirty with McIntosh hitting four sixes and Dumfries were regretting dropping him early. Bellwood (39no) backed up McIntosh (70no) and they took Greenock to a nine wicket win. 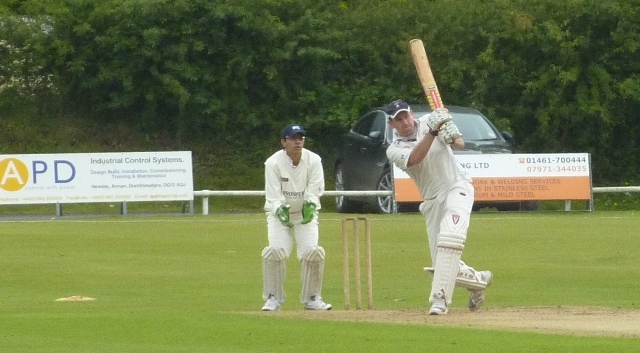 In the second game against Ayr, Dumfries also batted first. Breetzke (34) and Beveridge (20no) again figured as wickets went steadily during the innings for a total of 81 for 8. Despite wickets falling to Maskrey and Telfer to make it 11 for 2 once Preece (34) and Borland (20no) came together for the third wicket Ayr they were on course for the win. In their home league match against Titwood in damp conditions Site Electrical Nunholm reached just 110 with Davidson and Paterson the top scorers with 36 and 32. Nunholm were then unable the catches offered and, despite an excellent opening spell from Stuart and Niall Alexander, Titwood reached the target for the loss of four wickets. The following day Niall Alexander achieved his first cap for Scotland U15s opening the bowling in their two wicket win over Cumbria on Sunday in the ECB Championship. This Saturday APD Dumfries play Weirs at Nunholm in the Scottish Championship and are away at Hawick on Friday evening in the Border Murgitroyd Twenty/20 knockout. Site Electrical Nunholm play at home on Sunday against the Western Academy in the West SCNL Reserve League.